Snap Jax is a cool variant of Blackjack. In Snap Jax, the dealer (and the dealer only) will deal himself cards until his combined total reaches 17 or better. 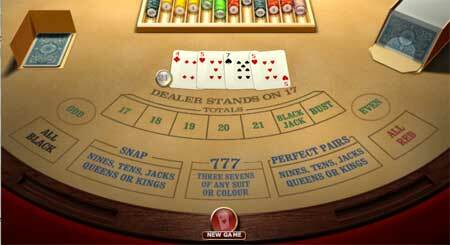 The dealer has to stand on any number greater than 16 (17 minimum) , where any number over 21 is considered "bust". Okay, sounds cool enough, but how do you "play" Snap Jax and how do you go about winning money? The final combined total (e.g. 18 exactly). The total being either odd or even. All the dealt cards being either red or black. There are a few other betting options too that can be found toward the bottom of this review. 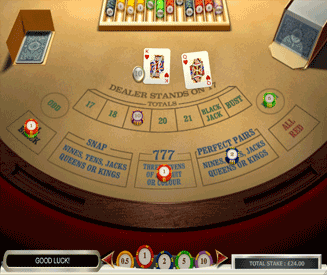 All in all, "Snap Jax" is essentially a simple variant of Blackjack, minus any element of skill (which is handy if you are terrible at Blackjack). Snap Jax fun rating - 64%. I'd say that the online Snap Jax game is more interesting/entertaining than outright fun. Placing bets and hoping to win big is always enjoyable (the biggest multiplier is 2,300x), but it's far from being the most exhilarating or dynamic game in the world. Whilst Snap Jax is a nice variant of Blackjack, I'm sure most Blackjack enthusiasts will be disappointed with the lack of a small element of skill. In Snap Jax you simply place your bets and hope for the best. There isn't as much in the way of interactivity or strategy. All credit to the developers for creating a funky alternative to staple casino game, but I'm sure that Snap Jax will always be the less-famous cousin of the big movie star. How to play Snap Jax. Cards from standard playing card decks will be dealt on to the table until the combined total reaches 17 or more. Bet on whether you think the total will be any number between 17 and 21, or more than 21. You can also wager on a bunch of other stuff, such as all the cards being either red or black or being dealt a pair of 9s or better. Think of Snap Jax of a variant of Blackjack. The dealer will deal himself cards until he has to stand on 17 or better. You can then wager on a number of different outcomes beforehand. The rules in more depth. The dealer will deal himself cards from the deck until the total reaches 17 or more. Jacks, Queens and Kings are each worth 10. Aces can be high or low (1 or 11). Any total of 22 or above is considered "bust" and no winnings are paid (unless you bet on the outcome being "bust". There is no limit to the number of cards that can be dealt. The dealer will continue until the combine total reaches 17 or above. Simple isn't it? It's just like a dealer is playing Blackjack by himself (or herself of course). The only stuff you have to learn about now is what you can wager on in Snap Jax. This is the fun bit. The betting options are straightforward too, but the names can be a little confusing. So here's a list of all the betting options in Snap Jax with and explanation of what they mean and their payout. The total. Bet on what you think the combined total will be after the dealer has stuck (or gone bust). All cards the same colour. Bet on whether you think all the cards dealt in one game will be either red or black. Even = 3x (there are only 2 even outcomes compared to the 3 odd outcomes). Snap. Bet on being dealt a pair of 9s or better only. (You will only be dealt two cards because a paid of 9s results in a total of 18, which the dealer has to stand on). Perfect pair. Bet on being dealt a pair again (like above), except that the pair will be of the exact same suit (e.g. two Kings of spades). 777. Bet on being dealt three 7s for a combined total of 21. Fact: The game of Snap Jax uses more than one deck of cards (6 to be precise), which is why it is possible to be dealt the same two cards in one game for a "perfect pair". Note: If the result is "bust", the even, odd, red and black bets are void. You can bet on as many or as few outcomes as you like in any one game of Snap Jax. For example, you can bet on the combined total being 21, as well as betting on all the cards being red at the same time.